Previous post: Eating on the Run at the Mall – and Staying Healthy! Next post: Sunnyside Bicycles: Bike the Blossoms! The 2016 Rogue Festival is almost here. KRL has been featuring several Festival performer preview articles over the last couple of weeks, and have several more to go between now and opening day, including a couple in this week’s issue! Last weekend we also published an article about the Festival itself. We will also be reviewing many of the shows once the Festival begins in early March, and we may even do some more video interviews. Check out our Rogue Performer event page for more information as it becomes available, and you can also check out the Rogue 2016 website. Science fiction and folk music are complementary ideas. This may sound strange to some, but for me, it just makes sense. So often, we think of science fiction taking place in the far-flung future, and folk music stuck in the far-flung past, but that’s not always the case. For example, Alternate History and Steampunk are genres of sci-fi storytelling that take place in the years gone by, and folk music can and has been made about the future. I’m far from the first to navigate this quadrant; the late David Bowie’s Space Oddity features some of his folkier arrangements. Cowboy Feng’s Space Bar & Grille by Steven Brust is a sci-fi novel from the 90s told from the perspective of folk musicians. Around since the late 1950s, there’s also “filk,” an entire sub-genre of fan-created folk, primarily focused on sci-fi and fantasy. And, of course, the original series of Star Trek played around with the idea of folk music in space. 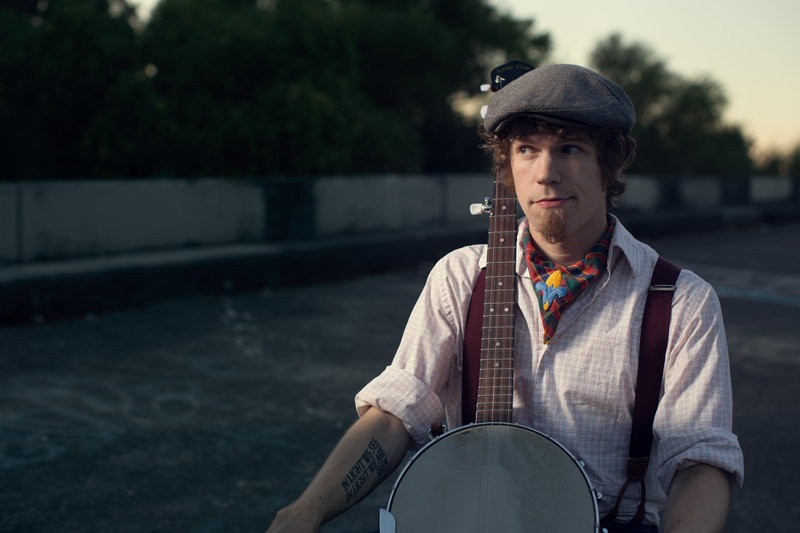 In the show that I’m bringing to the Rogue Festival this year, called Apocalypse Songs, I portray a poet/explorer of alternate universes whose main tools of documenting his strange experiences are a banjo and an ukulele. Why banjo and uke? Well, because those are the two instruments that I had lying around. But, they are also intended to be easy to learn and challenging to master. They are both outsider instruments, originally designed and played by regular people for popular music. Predecessors of the banjo can be traced back centuries in various regions of Africa, but the banjo as we know it was invented by American slaves in the early 19th century. Ukuleles were first created in the late 19th century by native Hawaiians, influenced by Portuguese instruments. Neither the banjo nor the ukulele have been the focus of great academic study until somewhat recently. The point is that these and other instruments like them were originally designed to be widely available and accessible to the public. For me, folk music is just one part of a larger idea, the idea of Folk Culture, which I see as a way of sharing ideas, a way that is accessible, inclusive, and communal. It doesn’t require guitars or fiddle. Folk Culture is writing a song and then sharing it with your friends. And if they want to record a version for themselves, why not let them? Folk Culture is encouraging everyone to participate in creating art and literature, not just the professionals. This is all in stark contrast to Pop Culture which is much more about commerce than community… But I’m getting ahead of myself. That’s a story for another time. Today, we find Folk Culture in modern technology as well, such as open-source software, creative commons licensing, collaborative production companies, and the very idea of a Free Internet. And I expect we’ll see Folk Culture express itself in other ways far into the future, wherever people want to share their experiences with others and create something together. It might not include banjos. But I’m not going to rule it out. Apocalypse Songs is being performed at Spectrum Art Gallery, 608 E Olive Ave, Fresno, CA 93728. You can purchase tickets here: roguefestival.ticketleap.com/apocalypsesongs. Saturday 3/5 at 1:45 p.m.
Sunday 3/6 at 8:15 p.m.
Thursday 3/10 at 7:45 p.m.
Friday 3/11 at 9 p.m.